I remember the first time a book really spoke to me. The main character was about my age, going through a lot of the same things I was going through at the time, and yet, she was something I was not but something I aspired to be--popular, cute, and put together. Plus she went on some amazing adventures and very nearly got herself killed a time or two. Oh, volumes were written about this character. I wanted to be her. Her name was Nancy Drew. Today, books speak to me all the time, but I don't choose my books so much for the main characters anymore. I mainly choose my books based on the setting. (Is that weird?) I'll think to myself, "Gee, I'd like to go to England today" so I'll head to the library and check out a good book that's set in England. England and the South are my favorite settings. In nearly every book I read, something pops out at me that makes me think, "Oh yeah, I do that" or "I think that, too." I turn down the page and come back to that little moment later, when I can write it down. 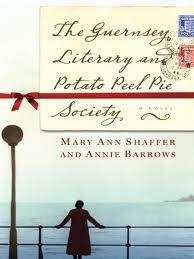 Last week I read "The Guernsey Literary and Potato Peel Pie Society" for the second time. I wanted to be transported back to England, and I remember loving that book the first time around, so I picked it up again. I'm so glad I did. I loved every moment that I spent with that eclectic group of characters. One section of the book really caught my attention because the authors picked up on my own motherly instinct/quirky thing I do. First, a little background. The main character in the book is Juliet (don't you love that name? ), a single journalist who's trying to figure out if she wants to be married or not. She learns about what the people of Guernsey have to go through when the Germans invade their small island, and she wants to find out more about their lives during the war so that she can write about it. In the process, she becomes attached to a motherless little girl named Kit. As she's getting to know what happened during the war, she learns that, just as the Germans are about to descend on the island, which is situated not far from France in the English Channel, all of the children are rounded up and sent to the main part of England to live with relatives or friends. Juliet is processing this information in light of the little girl she's fallen in love with named Kit. "I see myself becoming bearlike around Kit. Even when I'm not actually watching her, I'm watching her. If she's in any sort of danger (which she often is, given her taste in climbing), my hackles rise--I didn't even know I had hackles before--and I run to rescue her. When her enemy, the parson's nephew, threw plums at her, I roared at him. And through some queer sort of intuition, I always know where she is, just as I know where my hands are--and if I didn't, I should be sick with worry. . . . How did the mothers of Guernsey live, not knowing where there children were? I can't imagine." That's the part that got me. That's the moment in the book, this time around, that made me say, "Yes! I get that!" Not that I'm bearlike about my kids, but I do have hackles. Definitely hackles. But the part I totally understood was where she says that through some sort of intuition, she always knows where Kit is. I do that too. I always know, in some general way, where my girls are. I know that right now Caroline is at camp (a general sort of knowing, yes, but still, I know), Kate is riding to work with her dad, and Julia is upstairs in bed sleeping. Later in the day I will do another mental assessment of where each child is: camp, work, pool (maybe?). And at night I'll do another assessment: camp (probably by a campfire or hiking back from the dining hall), out with friends, at youth group. My mind is constantly thinking about my girls and where each one is at any given moment of the day. I've always done this. I do it so much that it's become a habit with me. And I wonder, will I still do this when they are older and have families of their own? Will I still think so much about my children that I will mentally place them wherever I think they might be at any given moment? I'm grateful to the authors of "The Guernsey Literary and Potato Peel Pie Society" because they helped me see the world in a new way--through the eyes of some brave survivors--but they also helped me see that the world, at least in terms of mothering, hasn't changed that much at all. Oh, I do love books. I need to know: if you're a mom, do you do this? Am I completely out of my mind? And if you're not a mom, how do you choose your books--setting, character, or plot? What's your favorite setting to read about? Oh Shelly, I definitely do that! I know where both of my kids are and do a little mental check on their whereabouts at least several times a day. And there are definitely times when I feel more assured about where they are and what they're doing than others. Know how I mean? Like if my son is at work and I know he's at work, then I feel he is safe, doing what he enjoys, and happy. But when I know he's on the road or out late with friends, etc., I feel a little unsure. Today my daughter is in a new camp experience, her second day. She is one of only a handful of kids who don't know anyone. Everyone else came with buddies. She's tired from attending a convention in Nebraska last week. She's got to compete for a part in two plays on Thursday and somehow impress the directors between now and then. She's in a room full of talent and just hoping her own talents rise to the top. She's vulnerable. She seems to be happy, content, but I don't know for sure. It's eating my lunch...if I let it! I love the Potato Peep Pie book too. I did it at our book group and there were quite mixed reactions! I am the same way about knowing where my girls are! As far as books go, I have a running list of ones I'd like to read (many are based on recommendations of other book lovers) but I tend to love series sets, historical time period sets (even if they are fiction), and of course, things set in the Deep South because that's where I call home! I tried to read that book and couldn't get hooked. Perhaps I should give it another try. First of all, I LOVED that book! I don't know if I have what you've described yet, but when Annalyn isn't with me, I don't feel quite right. So, I'm sure those hackles will show up at some point! I pick books on plot, but I like books because of the main characters. I just finished a book that was SO incredibly BORING because the main characters were boring. The story was fine and the setting/time was interesting. But the humorless characters killed it for me. I loved this book too! I'm thinking I need to do a reread on it too because sometimes I just read through it too fast and I miss a lot of the subtleties. I do the mental checks of where the kids are with the two that are still at home. The one that's not at home I know on certain days and times where she is but the rest is up in the air unless she tells me. Now choosing books, I don't pick settings. I usually always read the back to get a general idea of what it's about, sometimes a cover grabs me or in cases like this book and "The Help" I was just running into so many people that loved them. Just want to say "Hi!" I'm reading along through my email so I'm with you. I love all of your comments! And I'm so glad I'm not crazy about keeping a mental note of where all my kids are. :) You friends are amazing. Jo-Lynne, you should try it again. That book is such a treasure. Kay, I loved your last sentence that you kids have no idea how much you put into their mothering. Oh, so true!! I am a mom and my kids are grown and I do that every time I think of them. I place them and think about what they are probably doing. If I know they are going through a rough spot, I try to imagine if they are in need of a phone call or not. And I have four grand children, I do that with them, too. Thanks so much for talking about this book, I am going to try to get it at our library, I will reserve it on-line in they have it. two young kids constantly present it's hard to NOT keep tabs on them...let alone some quiet time without them. I loved that book! But I hate to admit I've forgotten much of it. What you described didnt totally ring a bell. Ha! I must read it again. I remember eating it up waiting for a flight. I pick pretty much solely by recommendation. OK, I sort of skimmed at the end b/c I haven't finished reading yet... but just had to pipe up and say, I LOVE THIS BOOK!!!!! what a great post! i have a whole book of quotes that i take from all sorts of avenues, mostly from books i read. i love that you said you dogear them and come back to them! Book(s) Review: "The Sword" and "The Gift"